A fountain commemorates James Wilson, who was the first Mayor of Berry in 1869. It was unveiled by Mr Lewis McIntyre, the oldest living ex-Mayor of Berry. James Wilson lived at "Glenworth" and was prominent as the founder of Wilson`s Stores. He was the first Mayor of Broughton Creek (Berry), and was elected on 22 January 1869. He died in 1901. The drinking fountain recently erected at Berry to the memory of the late Mr James Wilson, the first mayor of that municipality (January, 1869), was unveiled on Wednesday afternoon last by Mr Lewis Mclntyre, J.P., the oldest ex mayor of Berry. The ceremony was witnessed by a large assemblage of residents and visitors. Addresses were delivered by the present mayor (Mr.G.Gillam), Messrs John Stewart, Alex. Hay, and Alex. Campbell. 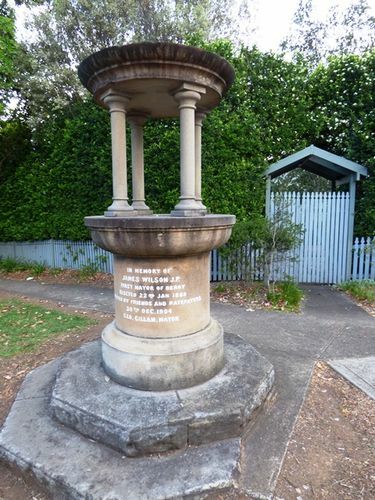 The fountain, which has already been described in these columns, is of neat design and came from the masonry yards of Mr J. Dudgeon, Nowra. The memory of James Wilson deserves perpetuation not only for the good general work he did for the municipality, but also because of the general assistance he gave the settlers in that part of the coast in times when the people had nothing like the conveniences of the present day. There were only a couple of timber carriages and a bark "humpy" in the locality when the late Mr Wilson settled in it fifty-three years ago. He introduced the innovation of a horse dray into the place. There was only a bush track, and none of the conveniencess or adjuncts of civilised life ; neither were there places of business or postal communication. The late Mr Wilson often travelled miles to extract a tooth, set a limb or perform some other office for some unfortunate settler, and there are many persons still living who speak of the departed pioneer as one who must have known something about medicine and surgery. The Shoalhaven News and South Coast Districts Advertiser (NSW), 14 January 1905. In memory of James Wilson J.P.